For research scientists, archaeologists and students from Texas A&M University at Galveston, the deep-sea discovery of three 19th century ships only 180 miles from their campus was like finding treasure in a new world. But they didn’t have to sail to the site, nor did they have to take the 4,300-foot plunge to the ocean’s depths. Instead, they explored the shipwrecks, while firmly anchored to Texas A&M’s Exploration Command Center in the heart of Galveston’s campus. Using remotely operated vehicles tethered to research vessel, scientists and their affiliates — including Texas A&M-Galveston, The Meadows Center for Water and the Environment at Texas State University, the Department of the Interior Bureau of Ocean Energy Management — investigated the shipwrecks last year after the vessels were located during an oil company survey. The project was coordinated and funded by NOAA’s Office of Ocean Exploration and Research. Linked by technology to the research vessel, researchers gathered around tables with laptops, peered at a wall-sized monitor and deliberated about what was being viewed on the floor of the gulf during the actual exploration of the ships. What they saw were extraordinary creatures, exquisite seascapes and remnants of human history. Last year, researchers found a tremendous variety of artifacts including navigational equipment, muskets, cannons, hides, tallow and even medicinal supplies like ginger used to treat seasickness. This year’s expedition discovered an antique clock. Evidence suggests these are three early 19th century ships that may have sunk in a storm. 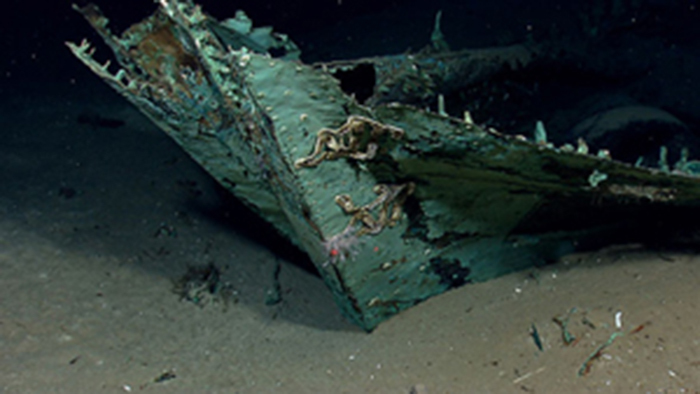 Frederic Pearl, director of the Maritime Studies Program at Galveston, said that the wrecks are very well preserved from an archaeologist’s viewpoint. “It was like taking a field trip to the bottom of the Gulf,” he said.